For an organization working to eliminate a specific injustice, anniversaries are not something to celebrate. The goal is to become superfluous. The fact that our work is still necessary is indication that we have not yet succeeded. So it is with Abort73. And just as aging individuals become increasingly introspective at the arrival of another birthday, so I become increasingly introspective at the arrival of our annual board meeting–which took place this past Saturday. By way of brief history: The name, Abort73, was registered on August 12, 2003. In August 2004, I announced my vocational transition to Abort73, and in January 2005, our first newsletter was published in conjunction with the "full" release of the website. As such, we are fast approaching the end of year eight in the brief life of Abort73.com. Like birthdays, annual meetings are for me a mix of celebration and despair. It's one part thanksgiving for all that's been done and one part regret for all that hasn't. Such is the nature of life and ministry. On the one hand, I can say in all honesty that Abort73 has come a long way since we started. On the other hand, there are times when I'm almost crushed by the conviction that we're just inching along in cultural obscurity. As much as any year I can remember, 2012 has been one of unrealized expectations–a year where reality has consistently fallen short of what I've been hoping and praying for. God is able to do exceedingly abundantly above all I ask or think, but that doesn't mean he always or even usually will. Rather, God has decreed that we live by faith, which is significantly harder to do when you find yourself in the valley of the shadow of death. Whether real or imagined, there is immense social pressure to put a good face on everything–to spin every setback into a positive gain. It's true in business and true in politics. Am I the only one who wishes candidates for office would ditch the relentless bravado and embrace a more humble posture–one that admits they can't predict the future, owns up to mistakes and doesn't try to maintain an air of infallibility? While there is certainly scriptural precedent for placing things in the best possible light, there is also scriptural precedent for honest expressions of frustration, discouragement and despair. We don't see a lot of that modeled in the evangelical church, which faces immense pressure of its own to suppress weakness, uncertainty and doubt. We talk often of the separation between church and state, but pastors and politicians face many of the same expectations-which may be why both church and politics can seem so disconnected from reality. Talking-point solutions may work in a hypothetical vacuum, but they fall apart when up against the messy struggles of everyday people. Looking at that list, I can safely check off the first two items (I think), but the next five are a lot trickier. Does anyone have even a small, mustard-seed size faith? It's not like we see a lot of mountains being thrown into the sea. And even if requirements 3-7 were perfectly satisfied, God still holds veto power with number eight. He is the potter; we are the clay. He is the Creator; we are the creature. I've had to come back to that fact a lot this year. Thankfully, that's a safe and honest place to be. Apologetics can only take us so far. Eventually, we all get to the place of saying, I don't understand, it makes no sense, but God is God. Now to Abort73. As I've done in years past, I'm including with this post a link to the 8-page, "year in review" document we looked at during the meeting–along with some of the notations that were added as a result of our discussion. It primarily focuses on web traffic, since that's the most objective standard we have for evaluating ministry success, but it also looks at giving, sales and expenses. Here's the long and the short of it. Giving is down; shirt sales are down; traffic is up. The good news is this. 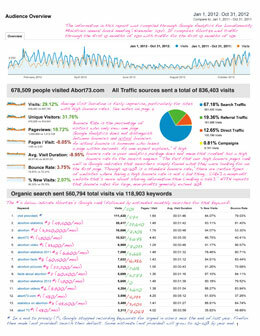 If I could only choose one of these metrics to see growth in, web traffic is the one I'd choose. Sales and giving are means of getting people to the website, but the website is the thing! By every indication, Abort73.com will have more than one million web visits this year, which is a threshold we've never crossed before. In ten months time, we've already exceeded web traffic from all of last year. That's the good news; the bad news is this. Our 2012 visit total would have been significantly higher had we not experienced a decrease in sales and giving. We would have had a lot more visits if we were selling more shirts and bringing in more donations. This is most immediately apparent in the relative decrease seen in direct traffic. Because traffic continues to grow via search and online referral, we still managed a net gain, but fewer shirts and fewer events are leading to less direct traffic–which is the highest quality of traffic there is, as evidenced by behavior statistics included in the report. Why do I obsess over traffic? Because more traffic = more education = more innocent lives saved from abortion. Last year at this time, I had just finished writing my first book, a call to Christians to Love the Least, and was looking forward to seeing it published. That dream remains unrealized. The acquisition editor from Zondervan who initiated the project was unable to get the rest of the editorial board on board. Other Christian publishers assured me that books on abortion are either unsellable or unnecessary (or both). Even my efforts to self publish have stalled. My other great ministry objective for 2012 included a relocation from Northern Illinois to the Carolinas, along with the establishment of a real office that could double as a store front. To date, our house is still unsold, and Abort73's finances are such that leasing retail space no longer seems remotely possible. Instead, we're looking for ways I can earn a part-time income away from Abort73, since the prospect of continuing to take a full-time salary is not promising. Those are the discouragements that 2012 has brought, but I'll end with a glimpse of hope. I spoke this week with a fundraising group from Texas who specializes in helping nonprofits increase their online giving. They found Abort73 online and sought me out to offer their services because they wanted to invest in an effort to combat abortion and quickly came to the conclusion that Abort73 is unlike anything else that's out there in terms of potential and approach. To that end, they are putting together a proposal for a year-end giving campaign at no cost to us–which is an extremely unusual (and timely!) offer. In other words, the year isn't over. The verdict on giving is not yet in! And even more important than that, I still have great hope in the work we're doing. I get discouraged, but I have not lost heart. I can't pretend to know what 2013 will hold, but held loosely in my hands are plans to expand Abort73 into Spanish and to create an optimized, companion version of Abort73 for mobile browsers. Both projects excite me, and both projects hold great potential in our continued struggle to change the cultural perception of abortion. I know it won't be easy, but I also know that it's far better than the alternative!